The Tai-chi exercise of Push Hands teaches you to let other people into your “space”. While the goal is to push your partner off balance, you also have your hands and arms connected and you move towards his center of balance to push. This creates an emotional tension. You don’t want your partner getting into your space to push you, yet you want to move into his space to push him. The unique Tai-chi resolution to this tension shows the genius of Tai-chi’s creators and also explains many of our society’s modern problems. Some push hands players will tighten up and spend most of their energy keeping you out. They are not really paying attention to you (your balance, movements and state of attention) but just to their own mental strategies. When they push, the movement of the push is disconnected from the flow of movements that came before. This reflects their internal state, that of the thinking mind ordering the body around but keeping the body at “arms length” from their own thinking mind. It is similar to the politics of isolating people according to their differences and setting them against each other. 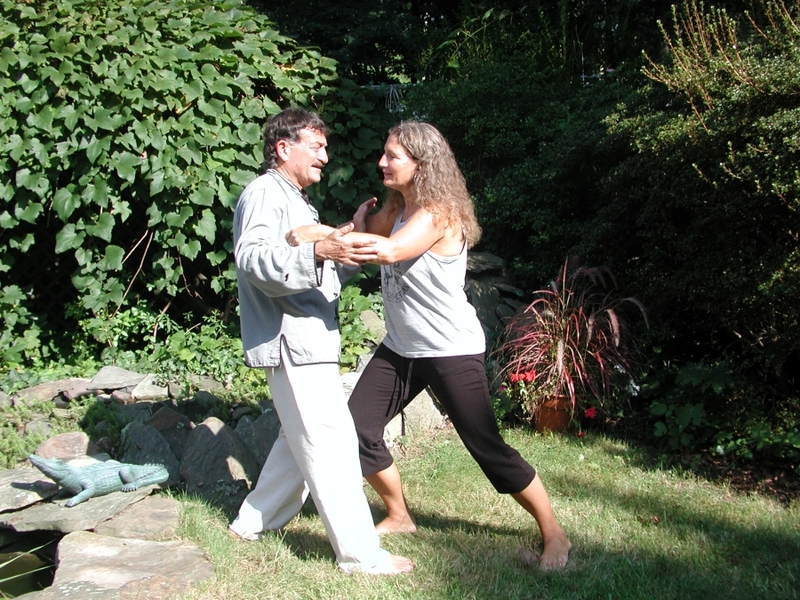 The Tai-chi approach to push hands is to consider the partner’s actions and your responses as one single unit. You allow the partner to make the decisions of movement and you stay connected with them, but offering little resistance. Whatever position they put you into, you are happy to be in that position, but you concentrate on being properly aligned and centered in that position. Part of that alignment is that you are in a good position to push the partner off balance. You use his movements to set up your body in proper alignment, rather than trying to take control and force his body to move according to your will. The forceful, disconnected approach gives you the feeling you are strong and in control. But if you are partnering with a good push hands player, your own feeling of strength and control always leads you to being in a weak position. The good push hands player fills the spaces within your power, preventing you from functioning. Yet he does this lightly. When two good push hands players are partnered, each tries to bring the forces within his own body. When his partner pushes, he absorbs the force, distributes that force among all his joints and into his root to empower his own response. In this way, the forcefulness of the partner is experienced as “raw material” you can use to add to your own power and return the combination back to your partner. Push hands then becomes an attempt to connect to, and transform forces rather than to build barriers to those forces. You become part of the flow of forces rather than a blockage to that flow. We are living in an increasingly “external” culture, in which we see each other as isolated physical objects battling against each other. We see the natural world around us as a store, providing products on its shelves, rather than as a living system that we are part of. When I practice push hands with most people and softly merge into their “space”, they harden up and resist, desperately trying to maintain their isolation and to them, Push Hands is a game of maintaining your isolation and feeling physically strong (tight). If the two partners can both merge, then Push Hands becomes a game of integration balanced with the attempt to push. It is a balance of merging and being an individual, a skill needed in any kind of relationship. Push Hands used to teach people that skill, but in a world of increasing isolation, this game too often reflects its host culture. If we can embody that skill in our everyday lives, then we can begin to heal the rift between the body and mind, allowing them to merge, which brings us internal peace. Remember the “Principles of Tai-chi Forms with Applications to Push Hands” workshop on Sunday April 17th 2016. Call (631) 744-5999 for more information. 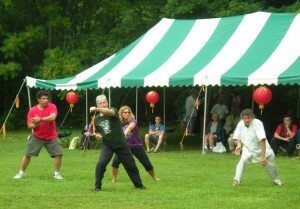 At the Tai-chi-Chuan School in Sound Beach, Long Island, N. Y. The source of joy in our lives does not come from external circumstances but from our internal state, according to Tai-chi and Zookinesis principles. We have created our own cage of fears and assumptions that blocks us from our full share of joy in life. Through proper training you find that there are areas of the body that are dead to your awareness. The body seems dull and clumsy rather than a finely tuned, intricate mechanism. Your attention seems sluggish and small rather than expansive, detailed and agile. Proper training in these disciplines begins with bringing the body and attention (consciousness) back to its original vibrant and powerful state. You first learn to be aware of every muscle and joint in the body, how each feels and how each works. Students find that they are using far too much effort and movement to accomplish their tasks such as the Zookinesis exercises or Tai-chi forms. As an example, self defense students usually respond to the opponent’s strike by trying to block the strike out of their way. This requires the force of their own arm and results in their arm knocking into the striking arm of their opponent and getting bruised. Through proper training the student learns to duck away from the strike and deliver their own strike into the opponent’s unprotected areas. He can also lightly touch the incoming strike, adding more momentum to it by pulling the striking arm in the direction it is already going. This throws the opponent off balance. The student can then easily throw the opponent to the ground or strike him. In either case you are using far less effort and energy than blocking. In the Push Hands exercise, described in many of the articles below, the goal is to push the partner off balance while maintaining your own stance. Beginning students tighten their shoulders, raise their bodies and push with their arms. This is very ineffective yet it makes them feel strong. They feel their own tightness and think they are strong. Soon they learn to sink their bodies, relax their shoulders and use their legs and hips to power the push. The arms become like shock absorbers, remaining slightly firm and springy. Yet the arms themselves do not push. The power of the push comes from the action of the whole body. The result is a lot more power and a lot less effort. These physical examples are used to illustrate the types of situations that each of us face in everyday life. Few of us get involved in the martial arts or will even encounter a physical conflict. Yet how many of us can avoid the daily psychological stresses in our jobs and family lives? By practicing how to deal with physical conflict in a controlled setting such as a Tai-chi class, we can apply the principles you learn to these everyday situations. You learn to remain relaxed yet powerful. As an example, notice how your shoulders rise and tense up during the day. First notice the feeling of the shoulders when you first wake up and then after you come home from work. There is no physiological benefit to tensing up the shoulders. In fact this can lead to headaches, tiredness and add to depression. It is just a habit. You can’t punch someone who is giving you a hard time and so the tension builds up inside of you. Many people say that they just can’t help it. But through Tai-chi and Zookinesis training you discover the very psychological mechanism that makes you tense up. You uncover the internal “control panel” for bad habits and learn to turn them off. You must be willing to change. Many of us feel that we are our habits. We resent the idea of changing. Yet these habits will kill us. In a sense, we identify with these “angels of death” as if they were the basis of our identity. With proper Tai-chi and Zookinesis training we learn to identify with our creativity, our health and our feeling of joy. We feel as comfortable letting go of destructive habits as we would letting to of a “hot potato”. As our bodies and our attention (consciousness) become more relaxed, powerful and joyful, this inner state affects our emotions as well. We find that the aggravations and angers we previously had were not effective in improving our lives. In fact they only served to hurt our bodies, minds and spirits. While it is difficult to let go of our self righteousness (because we feel that we are the perfect example of all that is right), this feeling seems silly after awhile. After examining all our faults – our tensions and poor mechanics of the body and mind – we can hardly fault others for the same problems. We understand the problems within ourselves and can better empathize with these same problems in other people. Yet we can only work to improve ourselves. Complaining to others about their problems is useless. If you clear out your own problems you can serve as an example to others without lecturing and complaining. There is so much beauty in the world and there is so little time to experience it. Why orient your attention to anything other than that beauty. You start by clearing out the debris in your own internal state to reveal the beauty that is already there. The sun “wants” to come in through your windows. All you need to do is keep the windows clean. Tai-chi and Zookinesis exercises fine tune our internal state so that the beauty of nature can always shine through. It is amazing how, just by learning not to tense up in reaction to external circumstances, our lives can change so much for the better. By loosening up all our joints and allowing our bodies to become flexible, we can overcome depression. Such negative emotional states are a reflection of the internal state of the body and the attention. Attention is a biological state of complete awareness so that every cell, muscle, bone and organ of the body feels fully alive and you feel connected to the rest of nature. The internal disciplines evolved during the time that people moved from living in nature to living in artificial surroundings such as cities. Our natural biological state was being caged by the physical and cultural surroundings. Tai-chi and Zookinesis helped people to live in such artificial conditions and yet retain their original natural power and joy. Remember that even though there is cement beneath your feet, there is living earth under that. We cannot let the concrete beneath us and the square walls around us imprint their artificiality on our spirits. Whether our spirits are caged or free is a choice each of can make, as long as we have the tools to remain free.